Top stories in Bahamian news. I’m supposed to be writing more regularly on this blog. I promised time and time again. But every time I sit and try to come up with a topic of interest I fall flat. These days I feel out of touch with my home. I’ve been a short-term visitor there for the past five years I don’t always get to enjoy the simplicity that makes people want to flock to our shores. It’s Better in The Bahamas has been our slogan since I could remember but when I think about the state of affairs and disarray, is it really better? Are there new job opportunities? Has crime increased or decreased? Are our political leaders creating and adjusting policies to reflect and better our modern society? Is customer service in the tourism and and government offices improving? Is the country progressing towards self-sustainability? Are we moving towards globalization, meaning are we creating partnerships with other countries to provider greater opportunities for our people to flourish and learn from others? A lot of these questions has a negative answer or a long wordy answer which still equates to NO so for me this is troublesome. I’m not bad mouthing my country by any means because I’m sure it could be a lot worse, but at the same time we shouldn’t live in an illusion and be comforted that we aren’t the very worst. Yet, still there are young Bahamians doing their thing and I must applaud them for making a way out of seemingly no way and creating path of their own. TAP of TAPs Vlogs and Sawyerboy TV are among our rising entertainers. Shift The Culture is making a name for itself getting people to think outside of the box. Kedar In Style (fashion), A Mouth Full (food), and a whole slew of others are out there and I applaud their ingenuity, bravery and talent. One day when all this schooling is done, I hope to lay the bricks down for my own path and add others to the bricks that were laid before me. So while life in The Baha has it’s challenges, with young people tired of the mess stew we’ve been wallowing in, a change is going to come. 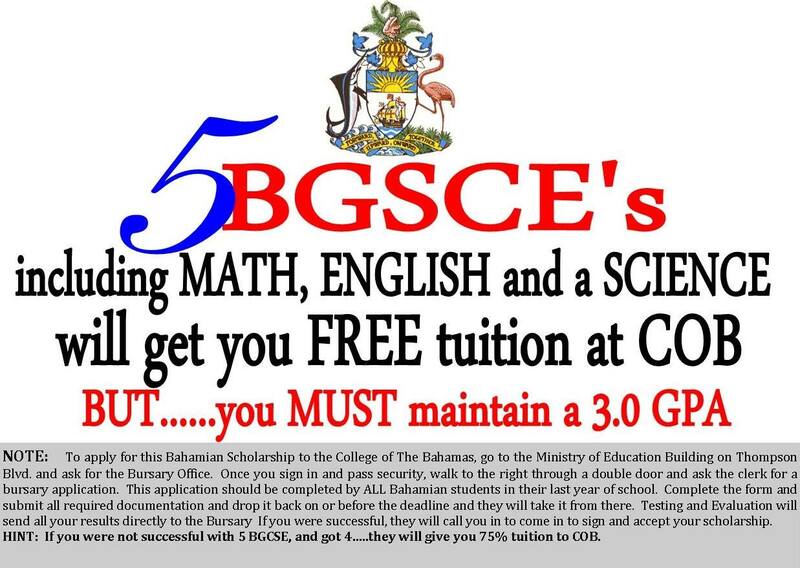 I recently saw an announcement through the social media websites about The College of The Bahamas offering free tuition to students who passed 5 or more BGCSE’s with specified subjects. I think this is a wonderful opportunity to help encourage students to continue and pursue continued education. For many, as inexpensive as studying right here at home may be, the funds are simply not there in some families, I know there was certainly none for me, thank the Lord for a full scholarship. But with this, it makes a degree more attainable and most students can and should look for part-time work to help cover the cost of books and fees. Countries like Germany and France have free tuition education all around so to see this, I’m glad that it’s a step in the right direction. What say ye? Bahamar has been the talk of the town as this multi-billion dollar resort missed their target deadline to open earlier this spring and additionally, it’s developer Sarkis Izmirilian filed for Chapter 11 bankruptcy in June. I personally never cared for our country having a mega resort but my opinion doesn’t matter and now that it’s almost, kinda, sorta here, I only wish them success because it means thousands of Bahamians can be employed. As for right now, those persons who were hired will now have to find other jobs and persons who jumped ship from the other hotels to get on board the blue Baha Mar bus will more than likely not be able to get their old jobs back. There were a lot of issues and concerns with this project from the beginning including whether or not BEC (our one and only electricity company) could realistically provide energy to the island and this mega resort sufficiently. There were complaints about the quality of work produced by the Chinese workers brought in to help build this behemoth. I just hope things can work out for them. As much as I’d like to share a thorough and well-developed opinion on the matter, I just don’t have the care to do so. For more information and updates, follow The Tribune. I like to think that tourists come here looking for a tropical, slower-paced, different kind of vibe, especially if they’re coming from bigger and more developed countries. Our islands in the sun don’t need a mega resort to be a selling point, we have nature and wonderful, friendly people. We have an amazing culture and a rich history worth sharing and merging to support the tourism industry. For the past few months in Bahamian news, besides waves of crime and gun violence, there has also been the issue of VAT or value added tax and how it will affect the individual Bahamian pocket. A lot of talk has been as to whether it will do more harm than good for The Bahamas in the long term and comparisons have been made to other countries that have a VAT system in place. I’m no expert on any of it so I’ll post a few links below that breaks down all the dirty details because unfortunately there are vast groups of people at home that don’t know or don’t care about what’s going on around them . 1. 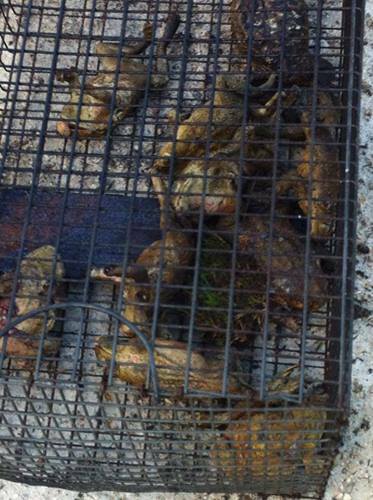 We’re being plagued by frogs. There are some disgusting cane toads (which are poisonous) have somehow made their way to our isle and and spreading. It’s a major concern for us because we don’t have any indigenous poisonous animals and without a natural predator to keep the balance, these bad boys can quickly be a disaster. 2. 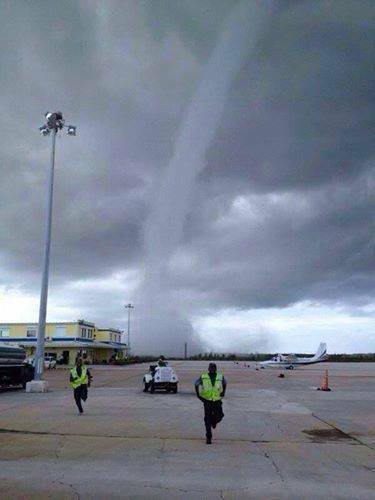 Today a tornado touched down at our international airport. 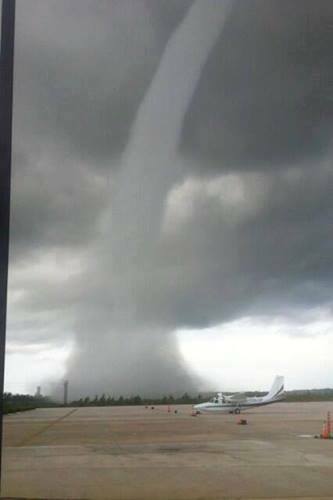 Yep, tornadoes in The Bahamas while I’m here in Kansas. Strange. Scary. 3. 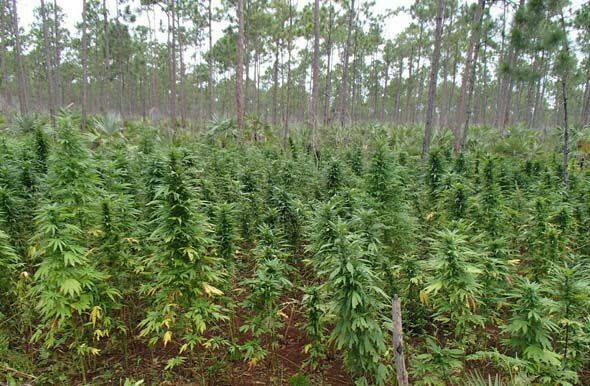 There was a major drug seize yesterday. The photo is of the actual seize.